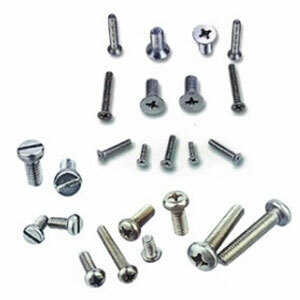 Machine screws are available in a variety of head types and materials. Pan Head: Pozidriv®, Slotted & Torx®. Countersunk: Pozidriv®, Slotted & Torx®. Available in: Mild Steel, Brass, Nylon, Stainless Steels, and Aluminium. These include: Zinc plated, Zinc Black plated, Nickel, Chrome, Galvanized.